The Gibson Historic ABR-1 is pretty accurate but there are two ways to tell for absolute certain if its a real one or a repro. Can you spot the difference? One of these is a repro, the other is a 61. 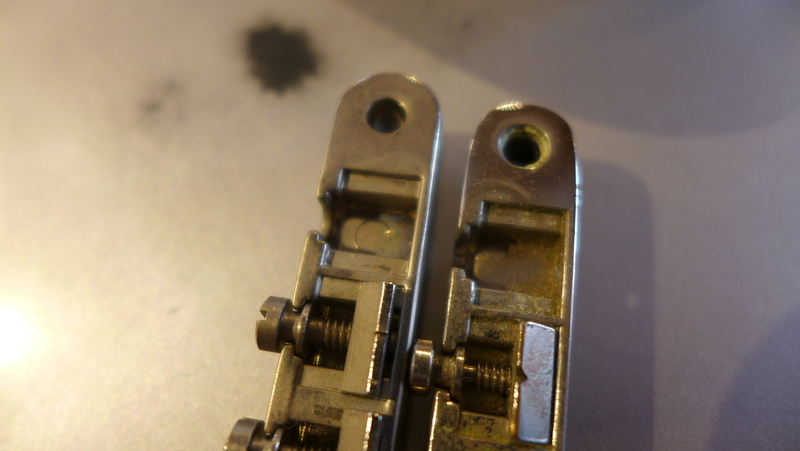 One of the things I never entirely understood is why a lot of Les Paul guys put vintage parts on their reissue LP’s. You can’t convince me that it makes the guitar sound any better when you put a $1200 ’59 stop tail or an $800 bridge on your 2004 R9. You could convince me that a PAF might improve the tone but I’ve heard plenty of boutique pickups that are the equal of a typical PAF that cost 80% less. Of course, if you want your R9 to have a pair of real double whites, you’re going to spend more on the pickups than you did on the guitar. A real 59 harness with bumblebees? $1200 or more. Yikes. Before you get on my case for selling parts for stupid money, keep in mind that I don’t set the prices. 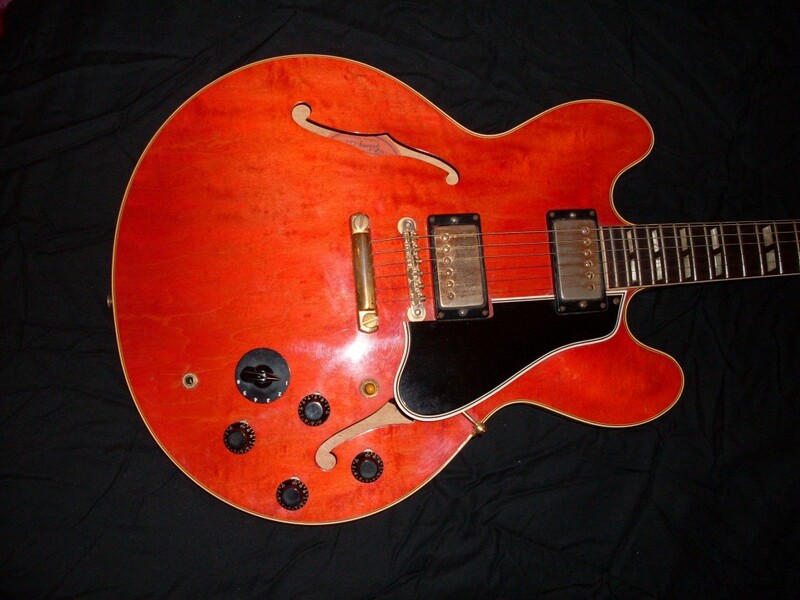 If I’m lucky, I’ll find a broken 335 from the early 60’s and scavenge some parts that way. 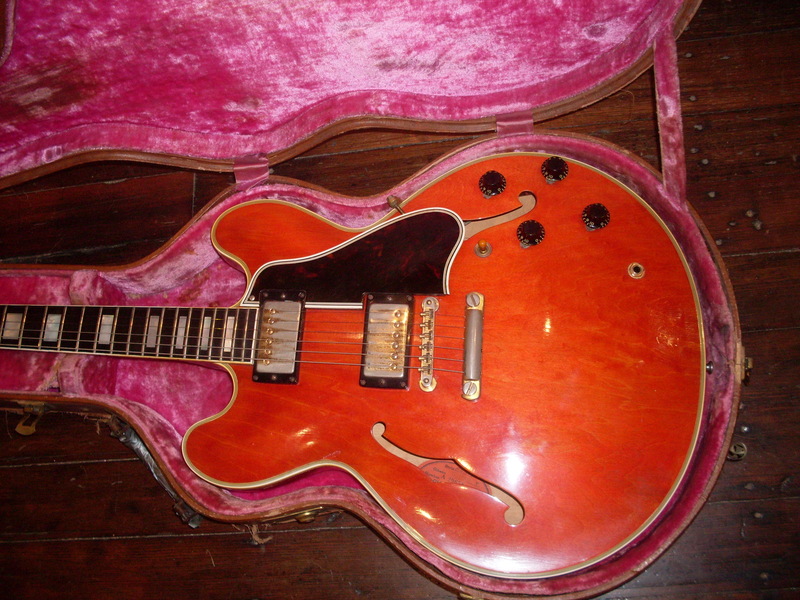 Also, did you ever notice that every time somebody has a vintage Gibson part to sell, it magically comes out of a 59? Every stop tail? 59. Every long magnet PAF? 59. Every no wire ABR-1 and single line Kluson? 59. When’s the last time you saw a listing for a 1960 stop tail? probably never. Not that it matters since a 60 and a 59 are the same. But you get the point. OK, but how about the repro stuff? Most of it is pretty good and pretty accurate. The Gibson Historic parts are close to the real thing. There are ways to tell them apart and I often (really often) see repro parts being passed off as the real thing. That said, there are lots of repro parts that don’t try to be exact duplicates. The part in question has to do its job, has to look like the original (from a foot away, anyway) and it helps if it isn’t all shiny and new looking unless you have the skills to do convincing aging (which I don’t). I’ll deal with metal parts in this post. The plastic parts have gotten really convincing as well and I see way too many of those too. The only bridge out there that will fool anybody is the Gibson Historic-the one that says “ABR-1” on the back and has that tooling mark next to it. You simply can’t tell them apart except that there are three separate “tells” that will tip you off. The saddles are the easy one-old saddles aren’t knife edged on the top and they have mill marks on the back side. But, it isn’t too hard to put vintage saddles on a repro bridge and it isn’t unusual at all to see modern saddles on a real vintage ABR-1. But take off one of the “E” saddles-high or low-it doesn’t matter. If there’s a round tooling mark under there, you’ve got a repro. Sorry. You can also look at the sharpness of the lettering on the underside but if you don’t have a real one for comparison, you’re not going to be able to tell. Use the tool mark under the saddle. It’s 100% accurate. Lightweight stop tails have become ridiculously expensive if you want the real thing. $1000 is actually a fair price these days. There simply aren’t very many out there. I saw one listed for $2000 on Ebay. Most of the repros are not very accurate but look pretty good and do their job perfectly well. The Gibson historic is shaped wrong-too square at the “ears”. The Creamtone is pretty good but the seam on the back is wrong. The real deal has a slightly hard edged hump on the top and that’s the first thing I check when I get a “new” vintage guitar. I eventually pull the tailpiece and check the seam but if its totally rounded on top, I know it’s wrong without any further action. The stop tail made by DMC, which has gotten tough to find,(usually sold by Crazy Parts in Germany) is really accurate as far as the hump and the seam goes. They were pretty expensive but were the most accurate by a lot. The only element they got wrong are the little round tooling marks on the front side of the tailpiece. Real Gibsons from very early have the same tooling marks but most don’t. So, it’s accurate to a point but if I see those tooling marks, I can be pretty sure it’s a DMC. The best thing to do is to look for the “short seam” on the back. Most repro stop tails don’t have it. Then if it’s there, check for the hump and the tooling marks. If the hump is there and the tooling marks aren’t, you’ve probably got the real thing. Lucky you. It’s the most frequently found “wrong” part on guitars that I buy and it’s almost never disclosed. Not because folks are dishonest but mostly because they don’t know what to look for. Now you do. That’s enough. We’ll look at other repro parts later this month. A real lightweight stop tail will have a very distinctive seam on the back. Most call it a “short seam”. The bottom one has it and is a real 59. The top one is a repro-not sure of the brand. Both of these stop tails have an accurate short seam. One is a real 61, the other is a DMC which is super accurate (and expensive) but has those little round tooling marks. 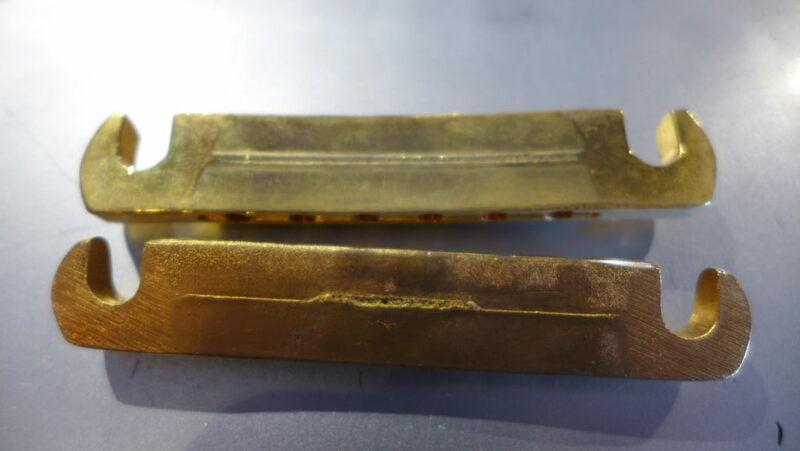 Some real Gibson tailpieces have the tooling marks-usually really early ones-but not many. So, if you see these marks, don’t freak out but it could be a repro. Before: neck shaved and broken in two places, two big ol’ holes in the top, wrong pickups and electronics, wrong guard. But original finish and that’s why I bought it. Every once in a while, I get an intriguing guitar offered to me that isn’t a one owner mint 62 or an ultra rare blonde 355 or an oh so desirable black 59 first rack 345. It’s a beater. Played to death and worth next to nothing unless someone comes to its rescue. I’ve had a few of these guitars and have put up the money to bring them back to the hands of appreciative players. It’s also very rewarding to bring a guitar back from the dead. Taking a true beater (busted or twisted neck, holes in the body from added mini switches, all changed parts and any number of other indignities) and bringing it back to life is not an inexpensive proposition and, to be honest, generally won’t make sense with any 335 other than a dot neck or maybe a blonde 345 or a stop tail 355. Why not bring back a 64? Well, it’s a really expensive proposition and the finished reclamation guitar generally isn’t worth even half what a no issue one would be. So, if you don’t get the beater for really cheap, don’t waste your money. A luthier built new neck is going to cost you $3000-$4000 to get it done right using the original board, inlays and truss rod. Gibson will re-neck a guitar for you but they won’t use the original usable elements (and it’ll still cost you $3-$4K). The good news is you can take a busted 61 that had a little teeny blade neck and put whatever size neck you want on it. I did that with a late 61 335 and also with a 60 335 and both came out great. But, say you get a beater 64 for $7000. By the time you’ve re-necked and put on correct hardware, you could be into it for $13,000. I’ve bought no issue 64’s for that price, so it’s not good economics in that case. But, say you find a broken 61 for 9K with some original parts and you spend $4500 to resurrect it. Then you’ve got a dot neck with the neck you want for $13500. You won’t be able to sell it for much more but you could have a great guitar at a great price (considering a no issue 61 will cost you around $24K and have a neck you might not like). So, meet my latest beater turned great player. I don’t suggest you go quite as nuts as I did on this one. 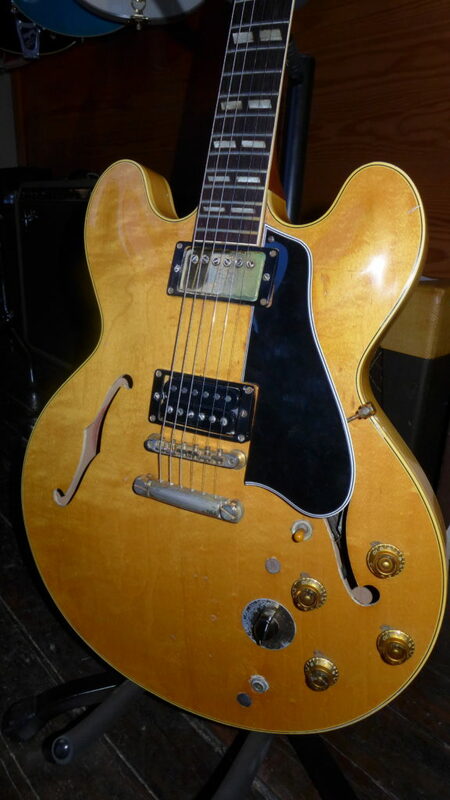 This true beater 59 factory blonde ES-345 had nothing going for it except for an original finish nd a great top. The neck was shaved and then broken twice. The PAFs were gone. The bridge was original and studs were correct as were the tuners. It had two big fat holes in the front as well. So, it needed the two big holes filled and it needed a new neck. There are many good luthiers who can do the work but Gord Barry of 12th Fret in Toronto has done a few for me and he gets it. The CITES nightmare has made getting repairs done in Canada a real pain but we managed to get it done. Here’s what was done: New neck carved to my 59/64 spec-that’s around .86″ at the first and 1″ at the 12th. A little smaller than a 59. A little bigger at the first fret than a 64. He used the original headstock inlays, original fingerboard and the original truss rod. Only the mahogany was new. He filled the holes with cross grain maple dowels and did as little finish work as possible. New stock frets and new neck bindings which were thinned and rolled were done. Hardware-wise, it’s getting double white PAF and a zebra, a new harness (335 not stereo 345) a no wire ABR-1 and a correct stop, original studs and tuners. The only repro part will be the guard until I can source a long guard with the holes in the right place (they vary a lot). What’s it worth when its done? Well the hardware, plastic and pickups alone are worth around $15K but it’s a bit over indulgent to put $10000 worth of pickups into a resurrected beater. But even with a set of double black long magnet PAFs, you’re looking at an original finish all correct blonde 59 ES-345 with a new neck and some filled holes. A no issue blonde 59 345 is a $55000 guitar. Is this worth half? I think so. I’d rather have this than a red or sunburst one that was refinished in blonde. The cool factor alone is off the charts on this one. It’ll be done in a day or two. It’s strung up now with no pickups and sounds great acoustically. I have very high hopes for this born again beater. UPDATE: It’s a monster and I’m keeping it for myself for now. After: New neck using original fingerboard, headstock inlays, truss rod. A double white and a zebra PAF and some vintage plastic and it’s ready to rock. Converted to 335 spec. Tailpiece is a later 60’s one but I’m on the hunt for a worn short seam stop tail. Guard is a repro. Everything else is correct vintage. Killer player too. 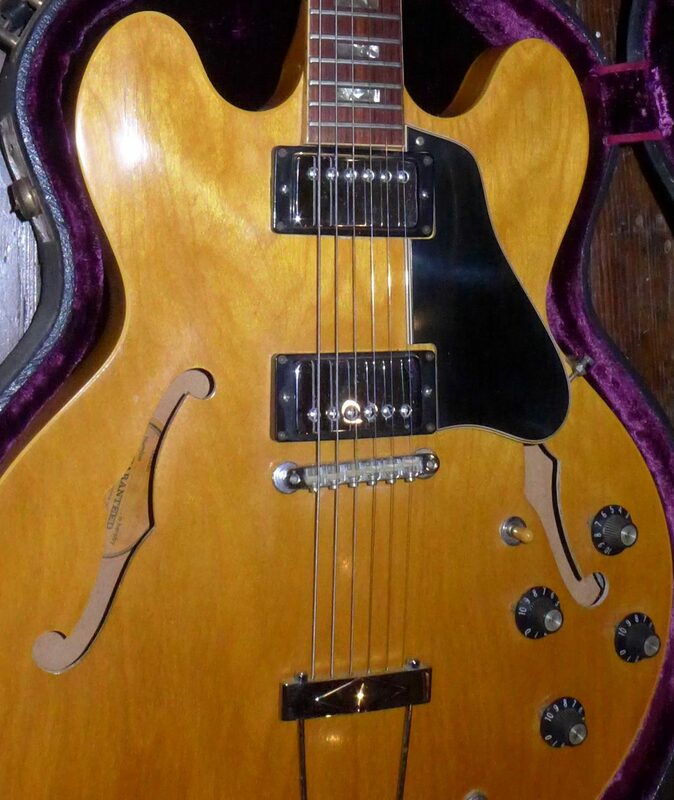 This is a “first rack” ’59 ES-345-these are a little different than later ones and command a premium and sell for $20K or more if collector grade. Later ones with the black VT ring are up there too. Later 59’s with the gold ring are strong as well, in the high teens. 60’s are catching up too. Bigsbys are weak and can be a good deal right now. This post will look back at 2017 with regard to ES-345’s and ES-355’s. 2017 started out with 345’s and stereo 355’s pretty much flat and pretty much not selling with the notable exception of 59’s. Owning a 59 of almost any model seems to continue to hold some voodoo cachet that no other year can quite match. Don’t get me wrong, 59’s are great but do they deserve the kind of reverence they seem to inspire? Maybe, but that’s a different post which I will get to. At the beginning of the year, I swear, I couldn’t give away 345’s from 1960 on. I’d have been better off parting them out they had become so stagnant. I look back at my records for the year and I see the 59’s flew out the door at strong prices-hitting $20K (or more) for clean early 59’s and the high teens for later (transitional neck) 59’s. But the 60-64’s were just not going anywhere. I had a gorgeous red stop tail 60 with no issues other than a repro guard ($1000 part) for $13K and it took months to move. And Bigsby 345’s? Anything over maybe $11K was going nowhere and I simply stopped buying them. I don’t think I sold any in 2017. By year end, the stop tails had perked up and PAF 345’s are selling well again. Bigsby’s are still a tough sell but that makes them a relative bargain if you can find a seller who hasn’t dug in his heels. And therein lies the problem. Nobody wants to lose money on a vintage guitar so few owners are willing to sell at a loss. They simply sit there in standoff mode. Stereo 355’s were no better than 345’s but monos were strong all year. Since 355’s, as a rule, always have a tremolo (Bigsby, sideways, Maestro), they can be a tough sell as well. Again, 59’s were the easy sell with prices pushing $20K for monos and stereos back in the mid to upper teens. Double white PAFs can tack on a few thousand. One 59 mono stop tail showed up this year and it sold at a serious premium (I only know of three) and a stop tail 60 sold recently as well from another dealer although I don’t know the price. In general mono 355’s sell very well and even those from 61-64 don’t hang around for long, although they don’t show up very often either since they didn’t make that many. Again, mid teens for clean examples seems to be the norm right now. A 60 mono will be a few thousand higher. Stereo 355’s from 60 onward were pretty flat and seem to remain so. There aren’t ever that many on the market so a true assessment is difficult. I didn’t sell more than a few, mostly from 60. A footnote to 355 sales is that more of them have shipped overseas. With CITES regulations over rosewood getting tougher and more countries enforcing them, I’ve started shipping more ebony board 355’s to folks who want an ES but don’t want to deal with the paperwork (which, by the way, isn’t that complicated). The OK crystal ball likes mono 355’s for 2018 and it also likes 59 and 60 ES-345’s. If you haven’t figured it out yet, late 59’s (gold Varitone ring) and early 60 345’s are virtually identical. The fat neck was largely gone by the early Fall and didn’t really get super thin until the late Spring of 60. So unless the 59 voodoo makes you woozy and opens your wallet, look for a fairly early 60. Any serial in the A33600 or lower range is bound to have the medium(ish) neck of a late 59. The blade thin neck is the rule after that right through most of 63. There are no hard and fast rules when it comes to neck profiles, though. I’ve had fat 60’s and super thin 59’s. There is nothing to stay away from. Vintage is still a good buy and ES-345’s and stereo 355’s can be real bargains. Do your research and don’t pay stupid prices. If you still aren’t sure, email me and ask. Even if it’s a guitar being sold by another dealer or individual. If I think it’s a good deal, I’ll tell you so. If it isn’t, I’ll tell you that to. It’s not always easy to tell everything from photos, so get an approval period of at least 24 hrs. 48 is better. And if you think I’m wrong, you don’t have to listen to me. It is, after all, your money. This 59 mono stop tail ES-355 showed up in 2017 and sold to a rock star. But I don’t kiss and tell. 59 mono 355’s (Bigsby) ruled the 355 roost in 2017 and will continue to do so in 2018. This unusual Mickey Mouse ear 66 ES-345 throws a monkey wrench into a lot of my theories. This guitar, if not a top twenty, was very close. Best post 64 I ever had. It wasn’t played much (one theory gone), it’s not a stop tail (another theory gone), it’s not from the “Golden Era” (and another), it has a Varitone (ditto). I’ve given this post a fair amount of thought and have concluded that logic doesn’t serve us very well here. Logic says the larger the sample, the more valid the results. Let’s see. OK, let’s start with the largest possible sample-all the 335, 345 and 355’s that I’ve owned. My top ten list or top twenty list is compiled from approximately 500 guitars that I’ve owned and sold over the past 10 years or so since I started doing this seriously. Looking at the “also rans” might be illustrative. Where do all the later ones fall? Well, there aren’t that many later ones because I don’t generally buy them. 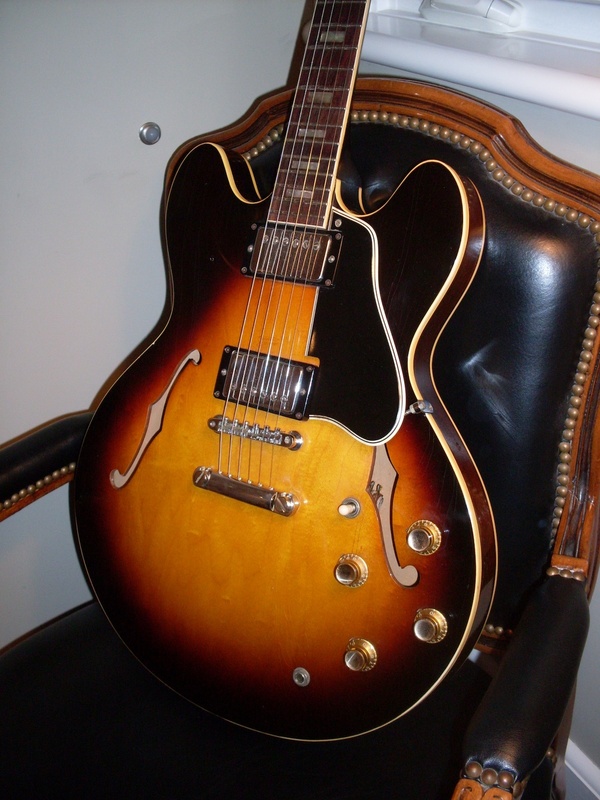 There could be spectacularly good 66 and later 335’s but I don’t get to play very many of them. It’s not that I don’t like them, it’s more that I wanted to keep my “niche” fairly small. I’ve owned a few dozen 66-69’s, so I have a pretty good handle on those but I’ve owned less than 5 from the 70’s. So, my opinion on 70’s guitars is no more informed than yours. The ones I’ve had have been playable, decent sounding guitars but none has impressed me and all were kind of heavy and perhaps less “335” sounding than earlier ones. Could be the changes in construction that occurred in the 70’s. Not much to be learned there. The 66-69’s have generally been pretty good. I don’t like the narrow nut but that aspect doesn’t affect tone. Nor does the Indian rosewood board on these. I’ve had folks tell me they can tell the difference in tone between the rosewoods but I can’t. The pickup changes that occurred during this period may be a factor-66’s generally have poly winding pre T-tops but by 69, most have T-tops. Later pre T-tops seem to lack some of the complexity of the early ones and T-tops, while very consistent, sound kind of thin to me. My conclusion? PAFs and early patents are a factor for sure. Short magnet or long magnet? Well, I’ve swapped out magnets more than a few times and I don’t hear that much difference between a long A2 or A4 and a short A5. I find short magnet PAFs to be more consistent but a great long magnet PAF seems to be best of all. I’ll take a good short magnet over a not so great long magnet though (yes, they exist). I’d also like to point out how much difference a proper setup makes. I recently had a Bigsby 61 brought to me as a trade. It had a Bigsby bridge installed rather than an ABR-1, a worn out set of strings (10’s) but other wise it was a pretty typical 61. Thin wide neck, PAFs, “normal” neck angle. But it sounded dull and lifeless. No sparkle in the bridge pickup, not much in the way of overtones or harmonics and crappy sustain. New strings made a difference but a few other tweaks made a marginal 335 into a really excellent one. I added a vintage ABR-1 with metal saddles (which I prefer over nylon). 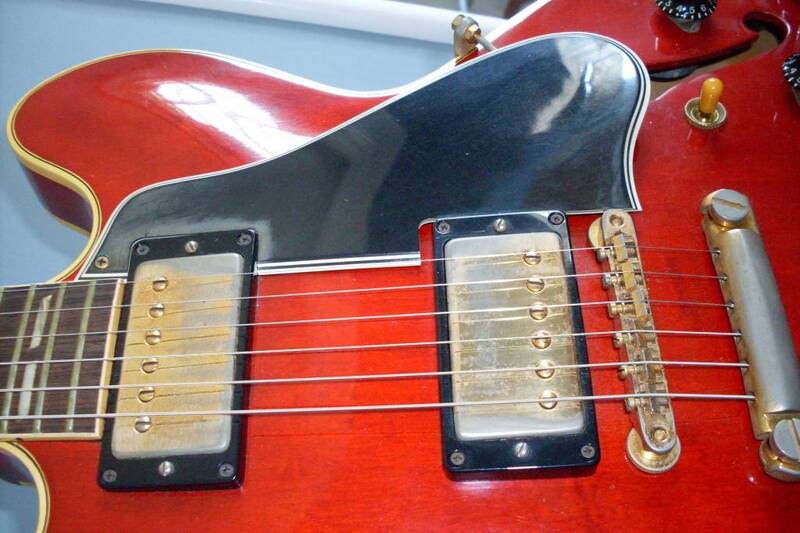 I raised the pickups setting them very close to the strings which seems to be the ideal setting on 335’s. I made certain that the saddles weren’t slotted too deeply-this is really important for sustain-and did the same for the nut. Finally, the neck was dead flat-it played fine that way but I dialed in a bit of relief. This allows the strings a little more room to vibrate freely and I find it makes a difference-especially for folks who like really low action. So much of the tone seems to flow from how freely the strings vibrate. Consider the things that affect this-saddles, nut, pickups (magnets can affect this), relief and the strings themselves. Getting these things right made quite a big difference in the 61 in question. What about the build quality? I believe that the guitars built after the “guitar boom” of the mid 60’s are marginally inferior to earlier ones. Instead of cranking out hundreds a year, Gibson was building thousands. 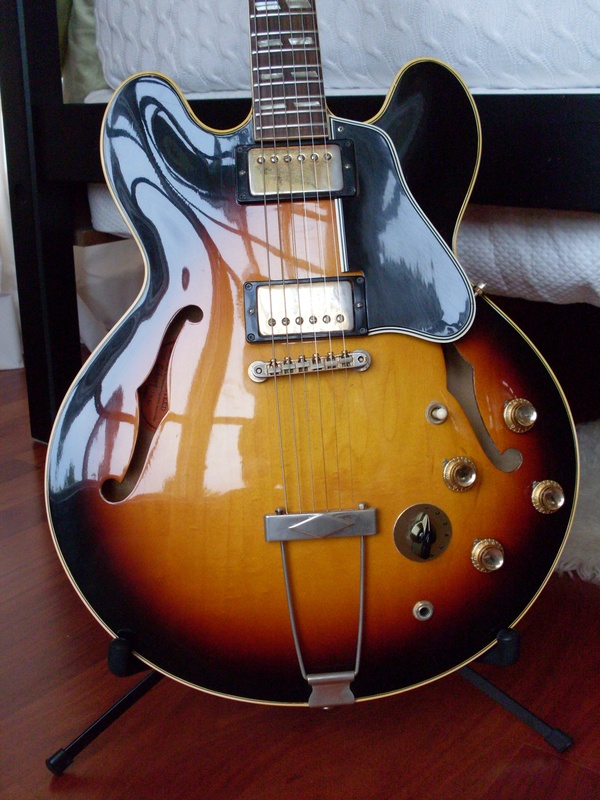 In 1958, there were 327 semi hollow ES guitars built. By 1967, there were around 7300 built. Not only did ES shipping numbers grow exponentially but all the other models did as well. That had to affect the build quality and, if you take a look at the amount of glue slopped around in a typical 67, you’ll get the idea. Finally, what about the quality of the wood used in the early days? I’m no expert here but I would guess that the quality of the wood in 1958 was not significantly different than the quality of the wood in 1966. What’s it all mean. It means that a great guitar is the sum of its many parts. You need 5 things. A great design, great wood, great build, great electronics and a great setup. Add a few decades of “seasoning” and a good amp and I think you’re there. Don’t let the shallow neck angle scare you. Unbound 58’s are always up there in tone and usually in playability as well once you get the setup right. 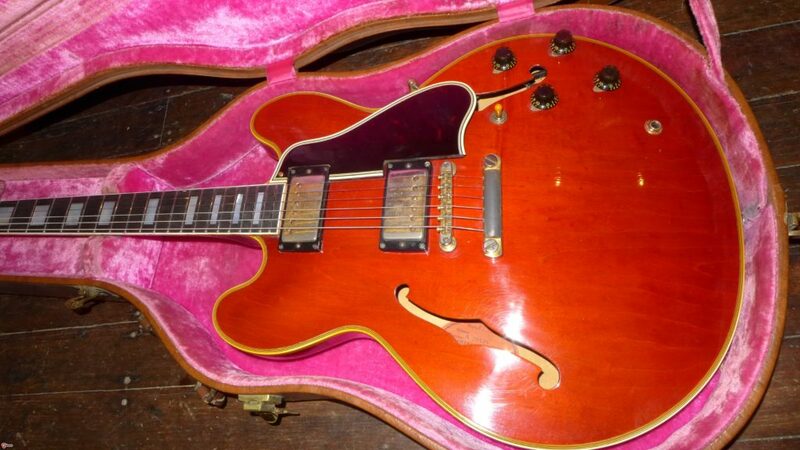 Number 9 on the top ten list is this 59 ES-345 in red-possibly the first red 345 ever made. The pickups are white/zebra, the neck is fat, the top is thick and the neck angle is normal. 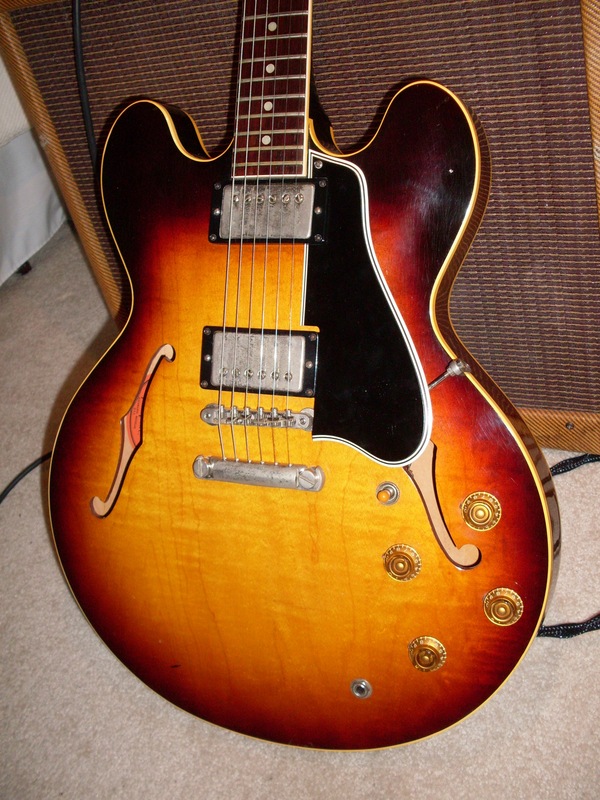 I try to keep a record of which ES-335’s sound best (“top ten”) which is not an easy task. First off, I sell all the guitars I get so that I have to remember what a guitar sounded like years after I last heard or played it. I keep notes on each guitar but tone is so subjective that I don’t trust my own notes sometimes. In fact, I’ve had guitars that sound absolutely great one day and not so great the next. I’m guessing that if I lined up the ten best 335’s I’ve ever had and played them one after the other, they would sound really similar if not identical. But my ears aren’t your ears and my taste isn’t your taste. And my amp isn’t your amp. Beyond that, if I took the next ten that I’ve liked, I don’t think the difference would be all that great either. In fact, I no longer rate them in order-just top ten best and top twenty. I bought an unbound 58 yesterday that is pretty close to mint and possible top ten contender. The conventional wisdom says the good ones get played. That’s often true but the converse is not. Just because a guitar is mint and barely played doesn’t mean it can’t sound great. If the original owner kept it under the bed and was a lousy player who gave up after 6 months in 1959, then the condition has nothing to do with the tone. This 58 is a monster. The dealer from whom I bought it thought it was the best 335 he had ever heard (and this was after I had agreed to buy it). I wasn’t playing it through a $12000 tweed Bandmaster either. I was playing it through a $1500 Gibson GA-80-a great amp but certainly not a legendary one. When I go back and look at my current list of the best 335’s I’ve owned, there are more 58 335’s than any other year and model. There are a bunch of 59’s (335’s, 345’s and a 355) some with a 58 factory order number (FON). There’s a 60 and a 62 on that list but 8 out of ten are 58’s and 59’s. Here is a list of the current top ten-ignore the order: #1 bound 58 335, #2 59 (58 FON) 335, #3 unbound 58 335, #4 59 first rack 345 and #5 bound 58 335 #6 is an early 60 335, #7 is a 59 355 mono stop tail, #8 is a refinished 62 335, #9 is a 59 345 and #10 is a 59 335. So, what’s the “secret sauce”? Is there any shared aspect of these guitars that tells us something about what makes them so good? All are stop tails. They all have long magnet PAFs except the 62 335. Many have the thin top-6 for sure, perhaps as many as 8-I don’t have notes on numbers 9 and 10-they could be either thin or regular tops. Numbers 1,3 and 5 have the shallow neck angle. How about the body depth? Body depth? Yes, the body depth kept getting deeper and deeper over the years. The typical 58 and many 59’s are 1.5-1.6″ deep. By 60, most were around 1.65″ deep. By 64, the average was around 1.72″ and by ’65, 1.8″ was not unusual. All have shallow bodies except the 60, the 62 and maybe one of the 59 335’s. What about neck profile? All but two have a chunky neck. The question is which aspects make the difference or is it a combination of all of them. Or is it the wood? Or how they were kept? Or how much they were played? So, we’ve got the raw data but its interpretation is the sticking point. Maybe I need to look at a larger sampling or maybe it’s impossible to know without having all of them side by side. Doing things like swapping out pickups won’t tell us much since 9 out of 10 have PAFs. But wait. We all know that PAFs are not very consistent. We’ve all had experiences where a pickup swap has made a guitar better. Most of us believe that if a guitar sounds great unplugged, it will sound great plugged in. I don’t buy that as a rule. It’s a decent starting point but it’s not gospel. So, I think we know a great pickup is a big part of it. I believe the thin top makes a difference. The data tells me that. Or does it? None of the top ten are blondes. Three are red. One is refinished. So, six are sunbursts. That’s data but logic tells us that the color can’t possibly make a difference. Well, that same logic might tell us what does make the difference. We will look deeper in my next post. 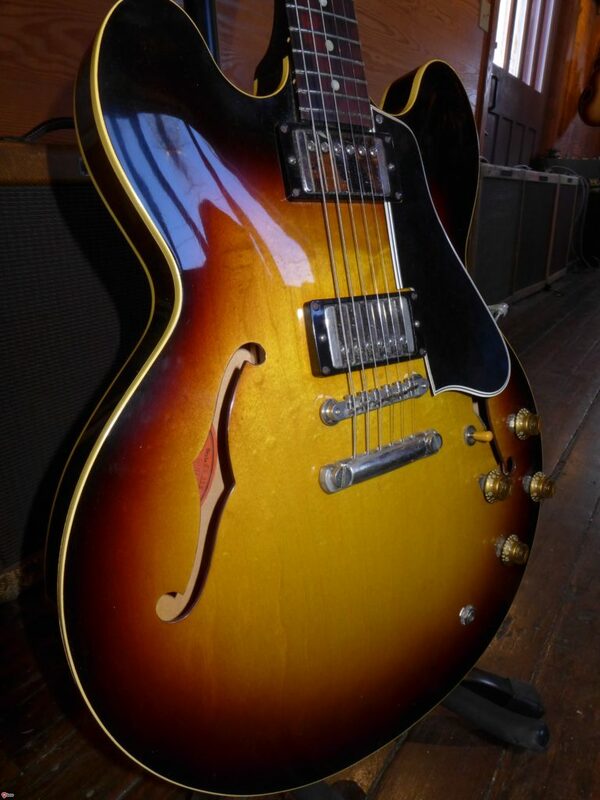 Number 7 on the list is a 1959 mono factory stop tail ES-355. Big neck, white PAFs (which we all know sound better than black ones), thin top. Best value there is in 335 land. This is an early 65 with the big neck and wide nut. It’s been converted to a stop tail (Yes, it’s placed a little too low) but for $8000 or so, it’s $10,000 less than a 64 which is almost the same guitar. Read on and be amazed. It’s not unusual for the vintage market to fall into familiar patterns. The most common is simple: Folks asking for more money than the guitar they are selling is worth. That’s just human nature doing what it does. Dealers do it, individual owners do it, widows and orphans selling Grandpa’s pride and joy do it. I will cover this phenomenon (which is particularly prevalent lately in dot necks) in a later post. This post is about the opposite phenomenon. There have always been guitars that seem like they are undervalued. They are desirable but, strangely, do not sell easily or for a price that is in line with similar guitars. They are often rare but command little or no premium for their rarity. There are also über rare guitars out there that are not particularly desirable that also command little or no premium (blonde Byrdlands are a good example). Then there are relatively common guitars that are quite desirable but just don’t get the respect (and high prices) they deserve. So what are these bargain basement guitars and where do you find one? The common one that comes to mind is the early 65 big neck 335’s and 345’s. The early ones with nickel hardware are virtually identical to a 64 except for the tuners and the tailpiece and yet they are priced at less than half the going rate for a 64. Even more surprising is the fact that they aren’t much more than the top of the line brand new Gibson 335’s. The tuner difference is negligible-double line Klusons instead of single lines. In fact, some late 64’s have double lines and that doesn’t diminish their value at all. So, it must be the trapeze tailpiece. So, having a trapeze tailpiece rather than a stop tail accounts for an approximately $10000 difference in price. Granted, only the earliest ones that have nickel parts definitely have the early patent number pickups but even some of those with chrome pickup covers have them (same as a PAF). Conventional wisdom seems to think that 65’s have t-tops. They don’t. I’ve never, ever, seen a t-top in a 65. Hey, for a $10000 savings, you can afford to have the trapeze removed and have a stop tail installed. You can even put in a set of PAFs and still come out ahead. Big neck early ’65 345’s are even less than 335’s and are one of the great bargains in vintage guitars. I’ve seen plenty of them for $6000 or so. They almost always have the early patents and even, on rare occasions, PAFs. 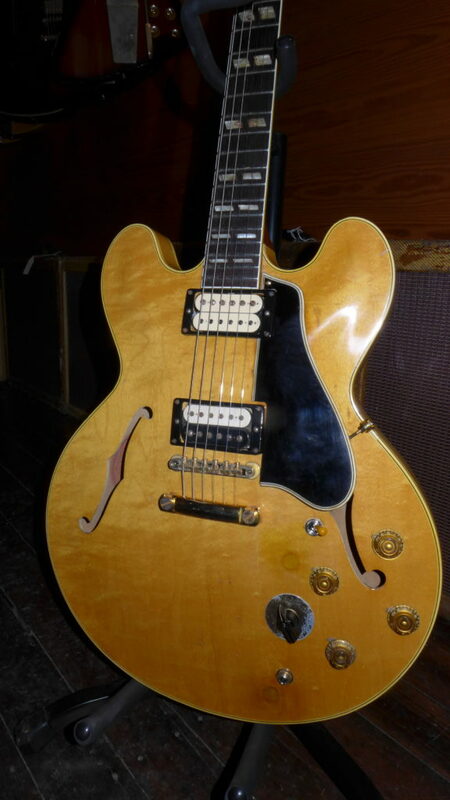 The best example of a very rare guitar that is desirable but is vastly underpriced is a blonde 59 or 60 ES-330. Dot neck 330’s (two pickup) are great guitars that are well priced to begin with. Consider a brand new 330 Historic is pushing $6000. A vintage block neck from 64 or even earlier can be found for less. Even a dot neck 60 or 61 can be bought for $6000. A 59 might go a little higher but $7000 is a typical selling (not necessarily asking) price. But the blondes are the real head scratcher. Consider this, they only made 294 blonde 330’s-most of them in 1960. A blonde 335 has pushed past $75K and can ask over $100K. A blonde 345 has long since passed $40,000 and at least two have sold for over $60,000. That’s way more than double the more common sunburst. 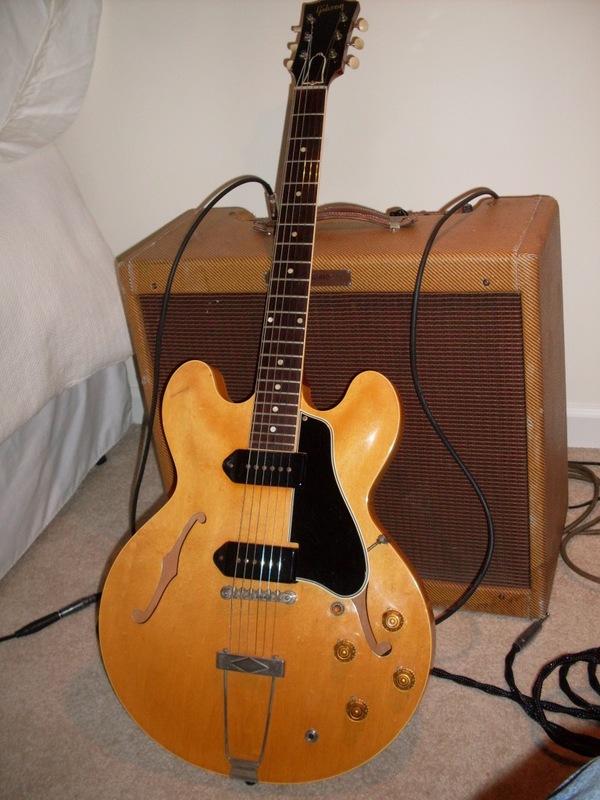 So, why is it you can get a blonde ES-330 for $10,000-$12000? Seems kind of low, doesn’t it? I do a lot of research and I look pretty hard (and in a lot of places) for the guitars I buy and yet I’ve only had 3 blonde 2 pickup 330’s in the last 10 years. Well, I don’t make the rules nor do I set the prices, so keep an eye out for big neck 65’s and blonde 330’s. They are the best deals out there and they are great guitars. If I see them before you do, I’ll be buying them. And you don’t need to take out a second mortgage. And you’ll get your money back when it’s time to sell. Great guitar and a great deal. I can’t believe that these guitars aren’t way more than the $10K-$12K they sell for. As rare as a blonde 335 and about one eighth the price. I’ll buy yours if you have one. This 58 sounded pretty good. Note how shallow the saddles are notched. Pole screws are pretty low but they don’t do that much anyway. OK, so you’ve set the truss rod for the way you like the neck and the action and intonation are good. You raised or lowered the stop tail into the sweet spot or maybe you came to the conclusion that there really isn’t a sweet spot and that’s fine. There’s no buzzing, so the frets and the nut are good, so you’re done right? You might be but maybe the sustain isn’t quite right or the balance between the pickups seems off or maybe the A string is too loud compared to the others. The truth is that, for some guitars, there’s a lot more to do. On others, there isn’t. A lot of it is personal preference but some of it isn’t. One of the biggest problems with 335’s is lack of sustain and the culprit is almost always the saddles. For a guitar to sustain, the string has to vibrate freely for as long a possible. 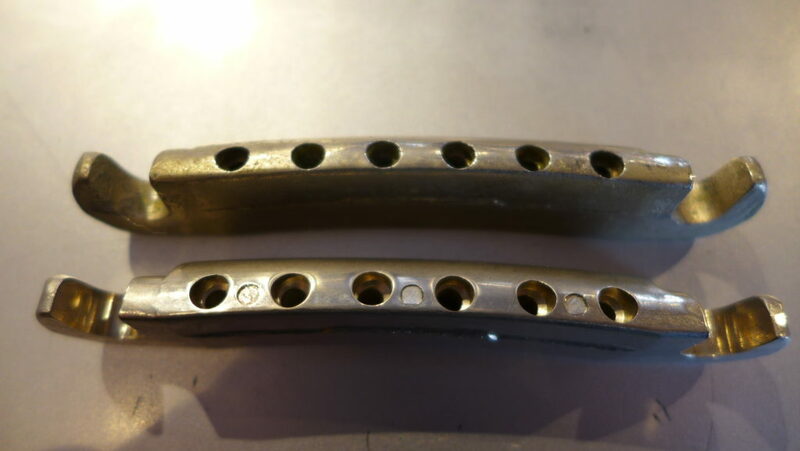 Since nearly all the vibration takes place between the nut and the saddles, you can bet the nut and the saddles are at issue when the guitar sounds dull or muffled. The wood could contribute to the problem as well but there’s no adjustment for that. Well, what could be restricting the strings? It could be that the nut slots are cut too deep or it could be that the saddles are notched too deep. Most 335’s I come across still have the original nut and while they are not without problems, deeply cut slots are usually not an issue. Slots that are too narrow are common which is why a lot of 335’s seem to go out of tune when you do a lot of note bending. That isn’t the tuners slipping. Slipping tuners will make your string go flat. 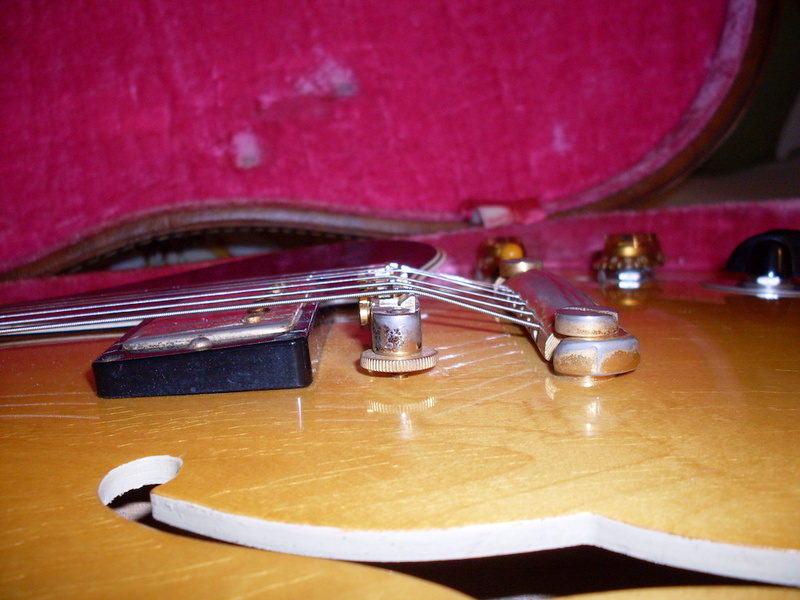 A binding nut slot (which is really common) will make the string go sharp. I usually fix that wth a little graphite (from a pencil). If that doesn’t work, talk to your luthier unless you are comfortable widening the nut slots. Assuming the nut isn’t the problem (and it probably isn’t), take a look at the saddles. I see saddles with multiple slots, slots that are way too wide and, most often, slots that are way too deep. To get the best performance out of your strings-meaning maximum vibration and sustain-the saddles should be as shallow as possible. The slots are there to keep the strings in place and it doesn’t take much of a slot to do that. On the wound strings, at least half of the string should be above the saddle, so the slot is no more than half the depth of the string. If they are deeper than that but you aren’t experiencing any problems, then leave them. If it ain’t broke… But if the guitar seems a bit lifeless, more often than not, it’s the saddle notches. It’s less of a problem on the wound strings but on the high E, B and especially the G, the difference between a really shallow notch and a deep one is huge. On the plain strings start with the shallowest notch you can cut. If the string pops out when you bend a note, then make it a little deeper and try again. If you have to get a new set of saddles, put the originals in a zip lock and put them in the case pocket. Somebody down the line is going to want the original saddles. Try to find nickel plated brass saddles. Vintage nylon are great, too but the newer nylon ones are too soft. The vintage ones with the flatter top surface seem better to me but the knife edge ones work OK too. Vintage ones are hard to find but they are out there. Lastly, let’s look at the pickup height. I start with them as high as they will go without interfering with the strings. That’s my personal taste-there’s no right or wrong-use your ears. If the balance between them is off, lower the louder pickup until they are closer to being equal. If the balance from bass strings to treble strings is off, raise one side of the pickup or the other until it sounds right. If a particular string is too loud or too soft, you can try adjusting the pole screws but I have to say that it really doesn’t seem to do much. I think the proximity of the magnet to the strings has a lot more to do with volume than the pole screws which are hardly magnetized. That should get you set up properly. I’m not a luthier, so I leave any major fret issues and the nut issues to them. You might want to experiment with different string makers or different gauges. I find 335’s sound best with 11’s or 10’s. 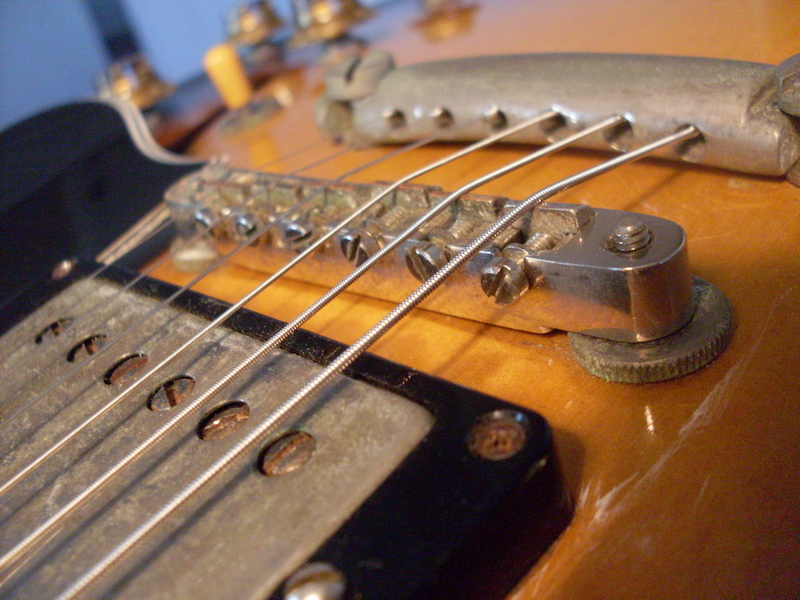 9’s generally don’t intonate well on older guitars-they simply weren’t made for lighter gauges. I have no favorite strings. I do like Pyramids but they are expensive and they don’t last very long. D’Addarios have always worked for me as have DR and a few others. It mostly depends on what you play and how you play. I like brighter strings. The larger point is to experiment and trust your ears. There is no magic formula. The pickups can be set pretty close to the strings. Start high and back off to find the tone that suits you. This is a 59 345. This is how I usually configure the saddles but there is no “right” way. Turning the G saddles is often necessary to get it far enough back to intonate properly. I always appreciate readers suggestions for posts. There’s only so much to be written about any given subject and when your subject is as narrow as mine and you’ve been writing about it for seven years, you will run out of subject matter. You will note that I’m posting less frequently than I used to. It’s not simply laziness or being too busy with other things, it’s just that I’ve covered almost everything. Going forward, going into greater detail on subjects already covered is a logical next step, so instead of writing about a PAF, I could do a post about magnets. Or tuner bushings. But this week a writer made a suggestion for a post that somehow slipped through the cracks. It should have been done years ago. How do you set up a 335? Or, more to the point, how do I set up a 335? I set up a lot of 335’s (345’s/355’s) and the good news is that they are pretty easy to get right and relatively consistent. I’m going to assume that you don’t need to recut or replace the nut or level the frets. These are really important elements for a good setup and it may be necessary to do one, the other, or both. But we will save that for later. First, play the guitar and decide what you don’t like or what is wrong with the setup. Consider the action, the intonation and the sustain. The action pretty easy. Raise or lower the bridge until you like the action. Then the real work can begin. If any of the open strings are buzzing, then you have a problem which we will address later. It can be the nut, it can be a fret or frets or it can be the relief (truss adjustment). Or maybe you simply have the action too low. Factory spec. is 5/64″ for the low E at the 15th fret and 3/64″ at the high E. I like mine slightly higher at the high E.
After getting the action where I like it, I look at the relief (the amount of bow in the neck). Sight down the neck. If it’s dead flat and there is no buzz, you can leave it alone. I like a little bit off relief-a small amount of bowing away from the strings- so I would loosen the truss rod a quarter turn to a half turn until I see a slight bow. You may have to leave it for a while. Truss adjustments aren’t instantaneous. If there is buzzing and you see the neck is bowed toward the strings, do the same-loosen the truss a quarter to a half turn. Leave it for a bit and go back and look. If the neck has flattened out or bowed slightly away from the strings and the buzz is gone, then you’re done with the truss rod. If it is still back bowed or buzzing, loosen the truss some more. If you run out of adjustment-the truss nut is all the way loose-then you will have to see your luthier. Back bows are rare in 335’s with big necks but not uncommon in thin 60-63 necks. Once I have the truss adjusted, I adjust the stop tail. This is more art than science. Raising or lowering the stop (skip this step if you have a Bigsby or trapeze) can make a small difference in sustain or no difference at all. 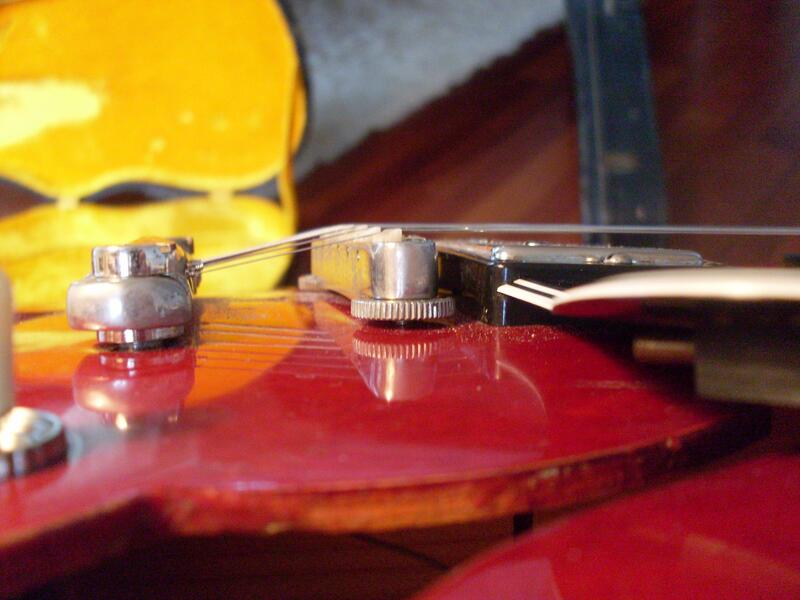 Some 335’s have a sweet spot usually a few turns up from being screwed all the way down. It’s trial and error and the likelihood is that it won’t much, if any, difference. You’re changing the string break angle which affects the downward pressure on the bridge. Some argue that the break angle changes the ease of bending notes. I’ve never perceived it. The theory is that less break angle means easier bending. You decide. Once I have the truss adjusted, I set the intonation. Using a good clip on tuner is the easiest way to do it, although I use harmonics as well. I assume you know how to intonate a guitar with an ABR-1. Be aware that 335’s were made to be played with a wrapped G string, so intonating a plain G can be tricky. Usually, you have to turn the saddle around so the flat side faces back rather than forward. That allows more adjustment back toward the tailpiece. 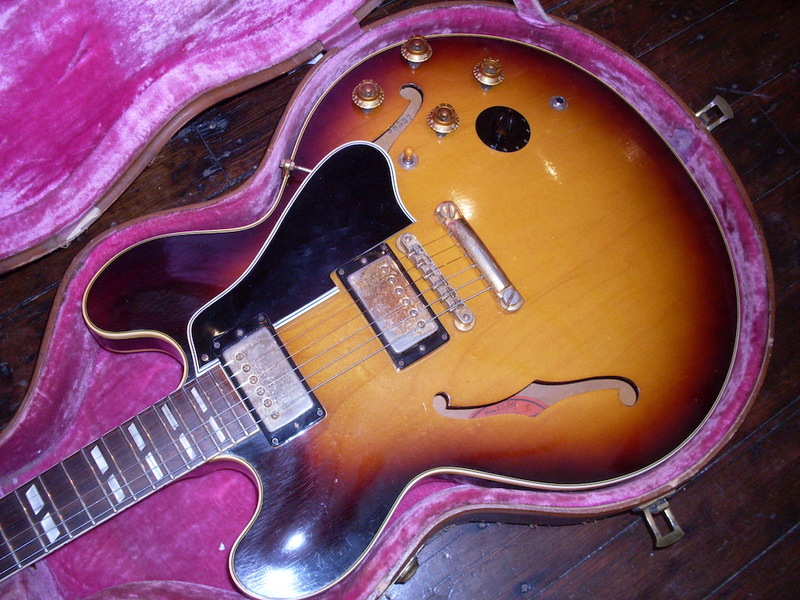 Most vintage 335s with 10’s require the G saddle to be as far back as it will go. Otherwise it will be sharp at the upper frets. 9’s generally won’t intonate well. I usually turn the top three strings flat side back but it’s usually only necessary to do the G that way. Once you’ve done the intonation and there is no buzzing and you are happy with the action, it’s time to plug it in. Next post will cover pickup height adjustments and what to do if you have buzzing or bad sustain. Adjusting the stop tail height changes the break angle of the strings. It may make a difference, it may not. There is no correct break angle, so try a few settings until you like it. If you don’t perceive a difference, a couple turns up from all the way down looks good to me. Lemme just pull these knobs off so I can re-solder the loose wire…huh? Some idiot glued the knobs onto the shafts. Now what do I do? There are a lot of things that guitar players do to their guitars that guitar players shouldn’t do to their guitars. Many of these things (on vintage guitars) date back to when they were simply old guitars and not worth very much. They were practical solutions to everyday problems. If a pot became scratchy, you replaced it. Who cares about the date code anyway? The tuners aren’t working so well, so lets get a set of those fancy new Schallers. The bridge PAF is little weak and a new DiMarzio will sound great. None of these things really mattered when the guitar was simply an old guitar. Few of us (me included) could have guessed that a ’59 335 that cost $600 in 1982 would be worth 60 times as much 35 years later. None of these things destroy the value, they simply lower it and most of these things are reversible with little damage to the guitar’s vintage value. And some are not. Refinishing always seemed like a good idea if your guitar got so beat up that it was an embarrassment on stage. Adding a Bigsby made sense if the music you played called for one. You know all this stuff and you know to look for these mods when you buy a vintage guitar. You can generally see them in the photos and many, if not most, sellers will disclose them. Then there are the insidious changes that you can’t see that simply cannot be reversed without destroying some expensive vintage parts. The volume knob is slipping on the pot shaft because the plastic has worn out. You can put a little tape around the shaft and that sometimes works. You can bend the posts of the shaft outward if you’re careful not to break them and that usually works. Or you can super glue the knob to the shaft and that always works. Until you need to get the knob off. And while you’re at it, lets do all four of the knobs since they could all use a little help. And the switch tip cracks and tends to get itself unscrewed after a few gigs. You could take it off and glue it back together, let it dry and screw it back on. Or you could put dab of super glue inside and screw it back down and that will keep that tip on there forever. I can’t tell you how many guitars have arrived at my shop with glued on plastic parts. Dozens for sure. Glued on knobs make it impossible to repair a harness without destroying $400 worth of knobs. Glued on switch tips cause fewer problems unless you need to replace a three way, in which case you will be replacing a $200 catalin switch tip if the guitar is a 60 or earlier. But wait, doesn’t acetone dissolve super glue?. It does but it can also dissolve the plastic but that isn’t the big problem (and I’ve tried this). The problem is that you can’t get at the acetone to where the glue is. What are you going to do turn the guitar upside down and carefully flow some acetone into the underside of the knob and hope it somehow penetrates only to where the glue is. Oh, and don’t get it on that nice finish. It will dissolve it. So, if someone has glued on the knobs or the switch tip, here’s what you can do: Leave it and hope the pots don’t go south on you. You cannot get them off and you shouldn’t try. You’ll only make it worse. And don’t ever use super glue to solve a problem like that. Get a new set of knobs and put the originals in the case. Or try the tape trick. And if the knobs have already been glued down and you’re selling the guitar, disclose it. And if you’ve never checked, please do before you sell it to me. I don’t think anything annoys me more. That should be the end of the discussion but I would like to reach out to everyone who reads my blog and ask for solutions to the problem. If you’ve got a way to get a glued on knob or switch tip off, I want to know it. And I want everybody else to know it as well. I thank you in advance. Just don’t experiment on a $35000 guitar with $600 worth of plastic. And if the knobs are slipping on your 335, take the doctor’s advice. Don’t do that.